Fifteen miles south of America’s most popular golfing destination is a little village time seems to have forgotten. Murrells Inlet. Where people are the way they’re supposed to be. I relocated to Murrells Inlet seven years ago from Los Angeles. I was looking for peace, contentment and a place where the government doesn’t tell me what to eat, what to think and what to do. I found it here in this beautiful little fishing village in South Carolina. Murrells Inlet is located on a beautiful, 60-mile stretch of gorgeous white-sand beach in South Carolina called the Grand Strand. The Inlet is where pirates used to hide. Now, its one of the most beautiful, natural and peaceful villages in the U.S. The best thing about Murrells Inlet is the people. The locals (as opposed to the vacationing northerners, referred to as Snowbirds) are not concerned with fancy cars, designer labels or popular trends. They are just as they appear. Many of the men wear baseball caps, drink beer and drive pick-up trucks. Many of the women are married and spend their time taking care of their families. Wednesdays are reserved for bible classes. In this neck of the woods, what you see is what you get. More often than not, it’s a smile, as the locals are naturally friendly, even to snowbirds. Most adults are married, with 25-year plus wedding anniversaries the norm, not the exception. People aren’t shy about praying over their meals and Sundays are for church going. If that’s not your cup of tea, you might be more comfortable in one of the many former plantations that have been converted to gated communities. Million dollar homes with all the amenities are sprinkled throughout the area, peopled by the increasing number of northerners who are relocating out of the cities. 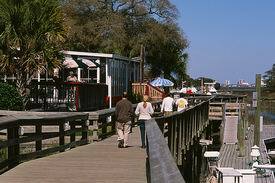 Just south of Murrells Inlet, Pawleys Island is where a lot of snowbirds now call home. They have imported their own culture, so visitors to the area can choose to hob-nob with the beautiful people or hang-out with the locals. Murrells Inlet is the place to dine. Dozens of small restaurants are lined up along the Inlet, most serving oysters from their own beds located 100 yards away. With a working fishing fleet, fresh seafood and smiles are served to visitors from Myrtle Beach to Pawley’s Island. There is something for everyone in Murrells Inlet. Fishermen have a choice of the Inlet, the ocean, or the Intracoastal waterway. Golfers have a choice of over 100 courses. Campers have a choice of several campsites right on the beach, next to beautiful state parks. World class entertainment is offered just up the coast in Myrtle Beach. The House of Blues, Carolina Opry, and Dixie Stampede are just a few of the venues. There are also plenty of water slides, museums, miniature golf and other tourist attractions for those looking for a little excitement. Below is the view from my kayak as I paddle across the Inlet to Garden City Beach. If you’ve ever watched Father Knows Best or Leave It To Beaver, you should have some idea of everyday life in Murrells Inlet. Laid-back is the first adjective that comes to mind. People here aren’t in any rush. Political correctness is just a word, practiced only in the gated communities. Vigorous debate is welcome and conservatives don’t have to go stand in a corner for voicing opinions. And when residents say “Have a good day,” they, by golly, mean it. If you are looking to leave the rat race, there is no better place to relocate. If you want to reconnect with people, nature and God, this is the place for you. My decision to relocate from Los Angeles to Murrells Inlet was one of the best decisions of my life. My priorities have changed, as has my faith in human nature. I have found peace and contentment in this beautiful sea-side village. And you can, too. I wouldn’t advertise it,if I were you,a lot of folks might take you up on it. That would probably ruin it,lots of people seem to do that when they find georgous places. Sounds wonderful,but if if you have to be predjudiced,like you are, to live there,count me out. Sounds like a great place, Nancy. I’m tempted to start packing my bags! I think there are a very large number of places in America where people live normal, reasonable lives with extended friendships and in peace. Doris, I have no idea what prejudice you’re referring to. Do you? In fact, there isn’t any in the article that I can find. Unless, of course, it’s prejudiced to want to live in peace and safety without gangbangers, serious drug problems, the constant threat of street crime, and all the other ills of places like New York and Los Angeles. Nancy- I would want to be your neighbor any day!!!! AND where there is any prejudice of any kind in what you wrote escapes me entirely!!!! This name calling whenever anyone expresses an opposing opinion about ANYTHING OF ANY KIND is just so childish. I bet d is a liberal and took offense to your comment about conservatives not having to hide there. Am i right or is this prejudice???? I don’t know Doris, so I don’t know if she is prejudiced. IMHO: Prejudice is merely learning from one’s life experiences – formally known as having an opinion. Beware of adopting the left’s definition of Anything. Many times, what the left says is prejudice is merely uttering a phrase that has been outlawed by the left under the guise of political correctness. Doris, I think you’d love M.I. We do have pur share of liberals. Only difference is our liberals don’t get off scott free when they make claims they can’t back up. I was referring to earlier articles written by you,Nancy,I am sure all of you know which ones they were. If you don’t,just reread your own words,espially about who you would hire. Hey D- you didnt respond to my question- are you a lib?????? Are you offended by a conservative point of view??? No tolerance for an opposing view??????? A bigot is a person obstinately or intolerantly devoted to his or her own opinions and prejudices, especially one exhibiting intolerance, irrationality, and animosity toward those of differing beliefs. I am not a lib. I only call it as I see it,in earlier articles,I found Nancy’s articles to be bigoted and not very nice. I agree with a lot of conservatives ideas and a lot of liberals,just not all of eithers. I think Nancy fits your definition to a tee. I am not offended by any points of view,as I am not usually the object of offensive comments,and politically,you cannot offend me. I am just against these forms of predjudices,and do not have just one side to my political views. Everyone has a right to their opinion,in my world,but I don’t think it is that way in Nancys,maybe not yours,either. I own a dictionary,too. Gosh,isn’t modern technology great,we don’t usually have to define words for other people. Did you even read her other articles? Or are you such a conservative,that you cannot see the forest for the trees? Seems to me that mature people ought to be able to make their points without resorting to name-calling. That’s best left out on the playground with the children. Tom- I retract my comments especially the bigot one & apologize for any offending comments. After all, this was about a beautiful place on earth & it digressed into some sort of dialogue way out of the context of the blog. I have to head out to the see-saw now….And no, that isnt meant to be sarcastic, but I take your comment seriously & accept the criticism & that is my final word!!!!! I will say,Nancy, you have beautiful toes. The place looks beautiful,too. Hey,isn’t this opinion forum? I thought that meant opinions,not just frilly words.